Rumi Darwaza was built by the fourth Nawab of Lucknow, Nawab Asaf-ud-Daula and is believed to be identical to an old gate in Istanbul called Bab-iHümayun, and so is also sometimes referred to as Turkish Gate. The 60 feet high gate is now considered an architectural marvel, but it built for a noble purpose. In 1748 North India, particularly Awadh, was reeling under severe famine and survival of a large part of the population was at stake. To help people overcome this Nawab Asaf-ud-Daula decided to build the Bara Imambara along with Rumi Darwaza for employment generation (think MNERGA program that's been developed to help the poor). Over the next two years these magnificent buildings were constructed and the labour of love is now there for everyone to see. Here's a quick video from my visit there recently. The architectural style of the Rumi Darwaza is completely in sync with the Nawabi architecture of Lucknow, and its significantly different from the Mughals. The material used for the drawaza is bricks and its then coated with lime, while the Mughals often used red sand stone. This is why the detailing on the Darwaza is more intricate, which would be impossible to achieve in stone. To me the Darwaza gives Lucknow is celebratory feel. It seems like tens of men are playing musical instruments and inviting everyone to join ins the festivities. 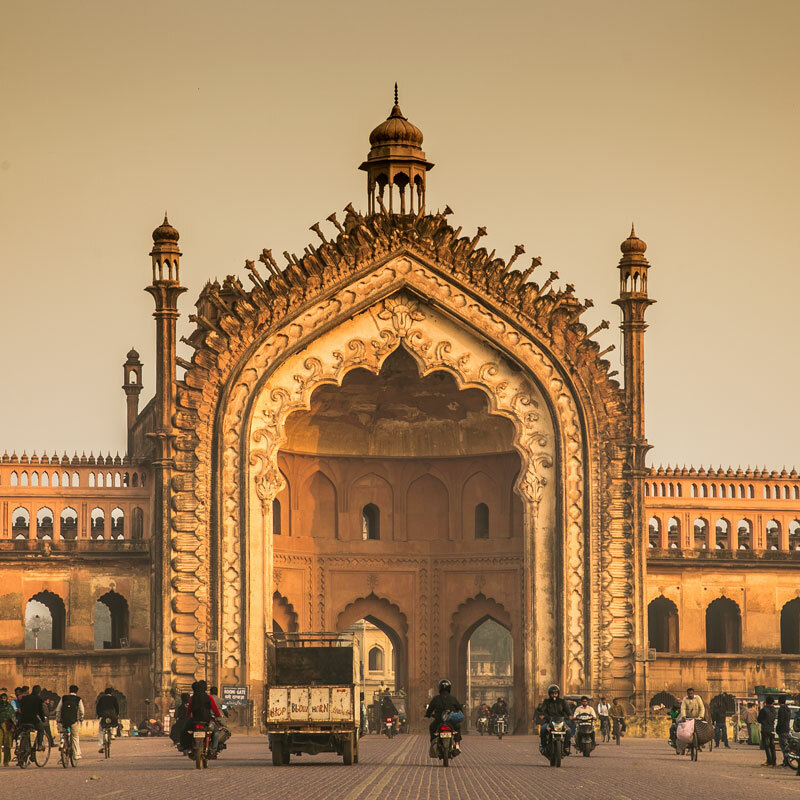 It's no surprise that the Darwaza has become the de facto symbol of Lucknow in recent times, whether it's tourism promotion or simply building a brand for the city. The doorway has seen generations pass underneath, and now it's decaying slowly. Structures made with brick and mortar have a much shorter life span compared to stone which was the material of choice for the Mughals like marbles in Taj Mahal, and with the excessive pressure of development around, the Darwaza is also decaying fast. A main road passes through the gate and the vibrations from the vehicles passing underneath add to the speed of decay. Also structurally its made with arches ends vaults without the use of lintels for support. If one part of the arch gets cracked, it can very quickly move to other parts as well. This is well understood, yet nothing much has changed in the last many years in the area. 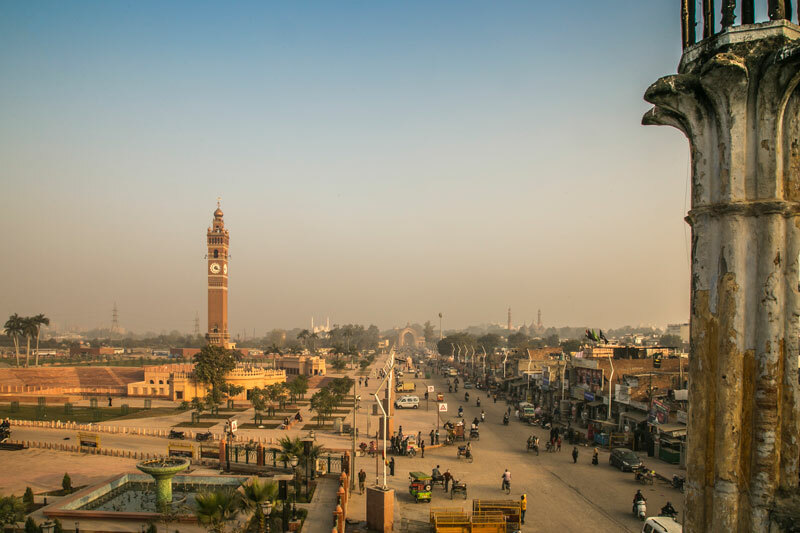 Recently the entire zone was developed as a heritage corridor, and one hopes that in near future all vehicular transportation in the area also stops completely. This is essential for the survival of many of these monuments in the area. It would be a bit odd if the city's loses this symbol which it has so lovingly adopted. So if you plan to be in the area and see Rumi Darwaza and other similar iconic buildings, I recommend you to do a Heritage Walk, instead of driving around in your car. Since it's gate on the main road, there is no fee to come and see it. However, I do wish they charge a fee for people to go up for more panoramic views of the city around, Of course, this should purely be based on the strength of the structure. I want to visit Rumi Darwaza again. .It is the symbol of Lucknow's tryst with destiny.One of the best place I have visit in my life.The circumstance gives best calm feeling.Thank you so much for the post also. 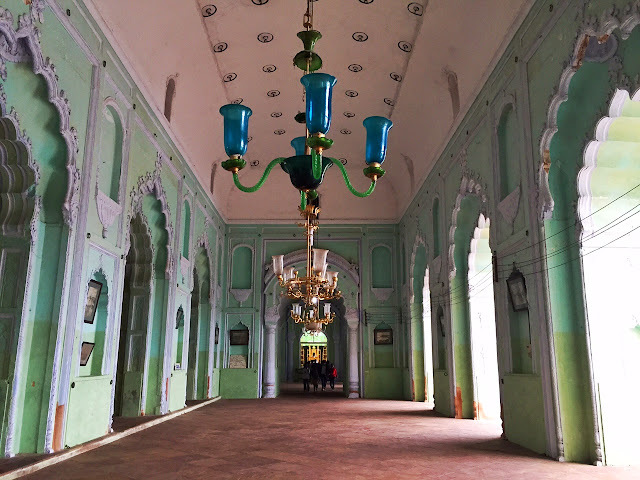 Lovely to learn more about the history of Rum Darwaza, it is indeed such a beautiful piece of architecture, so I enjoyed reading more about how it came to be. 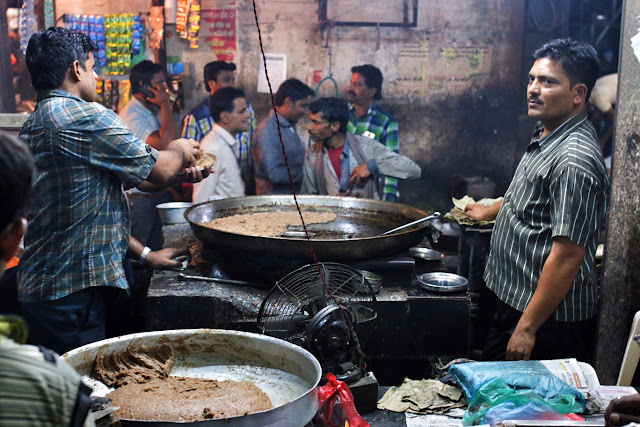 Oh wow, I never even heard of Rum Darwaza and now after reading this and looking at the photos, I really want to come and check out this place. Looks totally amazing. I'd never heard of Rumi Darwaza - the photos are amazing and I love your history of the place. Wow, that is stunning. I never knew any of this and now I want to go visit to see it in person. How beautiful. I would also love it if you can go on top for a panoramic view. But like you've said, only if the strength of the structure allows it. I hope the day when this area of Lucknow becomes pedestrianized will soon come, not only for the sake of the city's historical monuments, but also its identity. Thanks for sharing about this architectural gem. Rumi Darwaza looks beautiful. I hope they work on preserving it for future generations to see. These pictures are so beautiful Sid! I feel like I should take another trip to India to check out this place. Wow i haven't heard about Rumi Darwaza before!! It seems amazing!! Knowing the history of the place always helps you to get to know the place better!...The history of Rumi darwaza seems pretty interesting!! The fact that the bricks of the darwaza were coated with lime was alluring to know! But the fact that it's decaying fast now is pretty sad. The photographs are amazing! The history behind Rumi Darwaza is really fascinating to learn about. I never heard of this place but it really does look so beautiful. I hope that they will preserve this piece of beauty better so that others can cherish it. Rumi Darwaza looks stunning, I really love architecture. It is just about a year ago when I visited India, so I would definitely like to come back. Rumi darwaza izz simply osum...But, I can't understand one fact..The stones are coated with lime...why they did that..?? ?What is that purpose..?? Actually the Darwaza is not made with stone, but bricks. Lime coating is essential. I used to visit there several times during my collage times and, this magnificent door never failed to amaze me with its beauty and glory. This beautiful peace of work indeed gives a depth to the beauty of Lucknow and it certainly deserves a lot more care and affection. an architectural marvel! great pictures! Amazing photographs and very nice article. Thank you for describing fascinating fact of Rumi Darwaza, although this site developed as a heritage corridor but nothing to do very much in order to protect this site. I completely agree with you for the survival of this precious site vehicles should keep away or completely ban. And no doubt the photograph of Rumi Darwaza is stunning. Amazing Photography. I love Lucknow. It is great to know about Rumi Darwaza. Thanks for sharing this article with great pictures. Even lucknow metro logo has it! It is such a important part of the city. Hi siddhartha .I visited north two three times but never got a chance to visit Lucknow.Also i was unaware of the stunning Rumi Darwaza which is located in Lucknow .The pictures shared by you clearly depicts its beauty and perfect carvings.I am definitely going to visit it next time.Thanks for sharing. Hi Siddhartha!Travelling is my passion and hobby since childhood.I was more attracted towards foreign countries .But when my parents insisted me to check out your article about Rumi Darwaza ,I was shocked as I was unaware of such a historic and beautiful thing.We immediately visited Lucknow and i got to know the stunning monument.Thank you for sharing it.